Sadly, lifelong left-wing activist Larry Wayne did not live to see his work on the Jewish Bakers' Union published. But the Jewish Socialists' Group is proud to have partnered the Socialist History Society to bring out this remarkable story of how a group of immigrant and minority workers waged a tenacious struggle for decent pay, conditions and dignity, as part of the trade union movement. Many things have changed, but not the need for the spirit they bequeathed. Much has been written about the garment trade that dominated the East End labour market, first for Jewish immigrants and later for Bangladeshis. We know of their struggles to unionise and demand a living wage, the strikes for a 12-hour day with two breaks, and the craft-union style battles between different grades of workers. In this account, meticulously researched from both English and Yiddish sources, Larry Wayne has shone a light on the conditions and campaigns of a different set of workers forced to work even longer hours for less pay in equally torrid and cramped working conditions, while the tailors sweated. 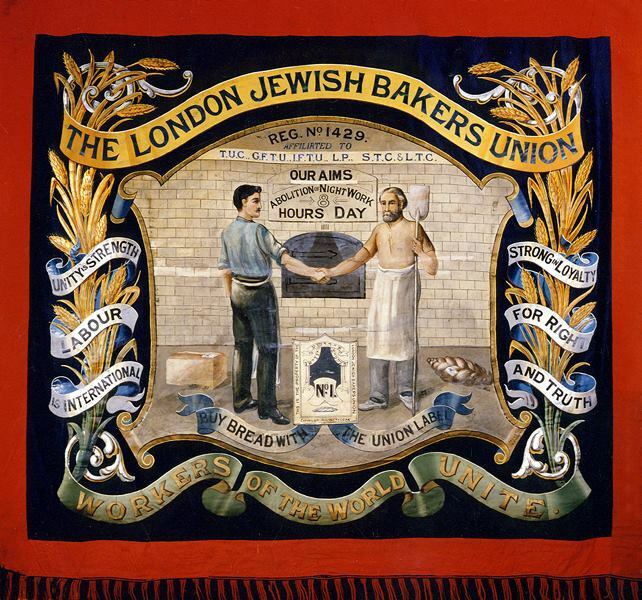 These were the bakers who, despite the constraints of working within small family-based firms, managed to create a union - the London Jewish Bakers Union. Though small in size and stature, it outlived other Jewish trade unions in Britain by many years. Its total membership rarely exceeded 150 individuals at any one time, but it fought continuously to ameliorate and challenge the exploitation of its members. Man cannot live by bread alone - so the Bible tells us. For immigrant Jewish workers of yesteryear, slaving away making bread on shifts of up to 20 hours, living was something they barely had time to do. When Jewish immigrants flooded into London’s East End escaping Czarist persecution, there were already many bakeries based within the local (non-Jewish) German community, but there was a demand for the special breads that Jews consumed in the old country. Within a few years up to 60 Jewish bakeries were established. Many employees in the German bakeries were already organised through the Amalgamated Union of Operative Bakers and Confectioners (AUOB), and increasing numbers of Jewish bakers were organised as branch 21 of this union - a branch later known as the International Bakers union, reflecting the diverse countries the Jewish immigrants emanated from. After periods of amalgamation and dissolution it eventually emerged as the London Jewish Bakers Union (LJBU). Larry Wayne does not romanticise their struggles - rather he shows the difficulties they encountered in organising a membership scattered in small enterprises where unscrupulous employers happily used unskilled scab labour from their families to break union campaigns. And he doesn’t skate over the in-fighting within political organisations supporting the workers. Rudolph Rocker’s Jewish anarchists influenced and led bakery workers in several strikes and campaigns but their tactics were often criticised by activists in the Social Democratic Federation. The employers’ organisations of master bakers were often more united than the employees and their supporters. Good to know that Chief Rabbis have always been such a help to progressive struggles! We might assume that the establishment’s newspaper, the Jewish Chronicle, would have been singularly unsympathetic to the plight of Jewish workers, but Larry Wayne shows that its labour movement correspondent’ often gave fair and supportive accounts of the Jewish bakers’ struggles. Other less orthodox union actions owed more to socialist thinkers. In 1894 several Jewish trade unions combined with the bakers to help them by-pass their employers’ intransigence by establishing a (shortlived) co-operative bakery. Other co-operative experiments followed, offering workers decent hours in sanitary conditions, but bad debts among an impoverished local population defeated them. The relationship of the Jewish bakers to their largely German non-Jewish counterparts fluctuated over the years. There were many instances of great solidarity, but also accusations that non-Jewish workers scabbed during Jewish bakery disputes. And from the German side, Jewish bakers were charged with undermining their attempts to prevent Sunday baking. In a period when trade unions were financially weak and with no welfare state cushion for the unemployed, the decision to strike could not be taken frivolously, but there were a number of strikes by the Jewish bakers, especially before the First World War. The most successful one was in 1913, at a time when, according to the Journeyman Bakers journal, 'a journeyman baker could be working a 90 hour week’ for the same wages as ‘a street sweeper working 8 or 9 hour days’. Through the 1913 strike the LJBU won reduced hours, better weekly pay, including holiday pay, and recognition of the union. The last recorded meeting of the London Jewish Bakers Union was in 1964, when it was down to 32 members and it officially wound up in 1969. But its great efforts to organise, including the attempts at co-operative production and its pioneering use of the union label should not be forgotten. Socialists often say: ‘We don’t want a loaf of bread, we want the whole bloody bakery’. Larry Wayne has shown that bakery workers have hardly been loafing around waiting for the revolution.